Enter your email address to subscribe our website. Hi , i wish to know the charge of the public bank unit trust . Why some of them said the charge is 5.5% and 0.25% ? And I wish to know nowadays people can buy unit trust through online , and UTC may not necessary for person who know how to use computer . I wish to know if i buy unit trust through online what is the charge between online self purchase and call for UTC to buy for me . hello mr. chin for equity fund service charge is 5.5% and for online is only 5.25%. Both Jethro and Chuah are right, FYI, if using epf to invest the service charge is 3%. Also, for some new fund the charges is 5.25%. Is the risk for doing investment in Public Regular Savings Fund (PRSF) considered high ? For regular saving in medium to long term should be fine for it. Can buy Public Regular Savings Fund (PRSF) on April 2013. It will declare dividen on end of Mar and price will be drop, then you can buy in at low rate. 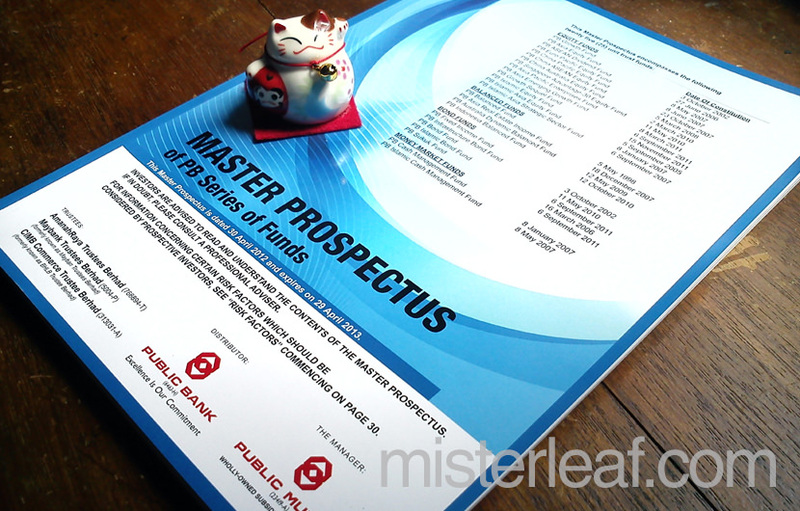 MisterLeaf.com a technology and commercial financing site, which is created by MisterLeaf and LiangLiang. This site’s content is comprehensive, focusing on computer technology, business and investment information. MisterLeaf.com is the Winner of “Malaysian Chinese Blog Award 2011” and "Malaysia Website Award 2016 (MWA 2016)". chin Bao AI on How to register and view TM e Bill Online?